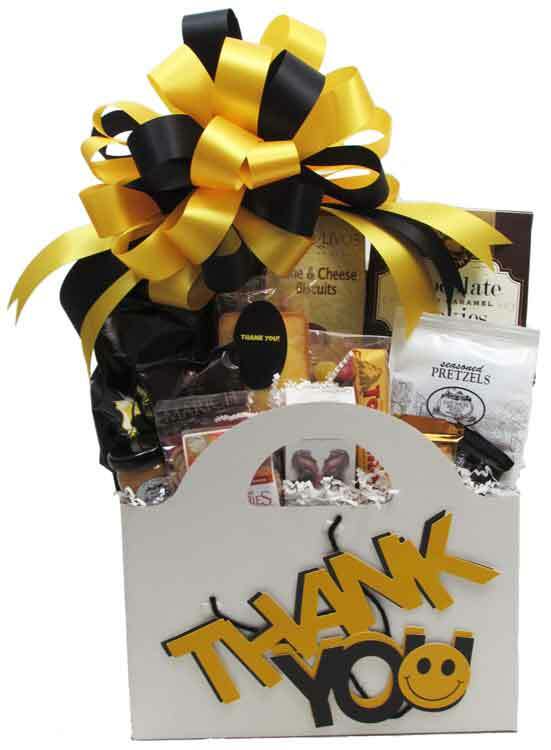 This container has a 3d effect with "Thank You" and smiley faces raised slightly above the container. Filled with Chocolate Truffles, Chocolate bottomed Biscotti (2), Salted Peanuts, Ghirardelli Chocolate Square, "Thank You" Cheese Straws, Marich Chocolates, Big Little Fudge Bite, two (2) bags of Twisted Pretzels (Smoky BBQ, Cheese Pizza, and/or Salted Caramel), gourmet Popcorn (Almond Pecan, Cranberry Walnut, Dark Chocolate with Sea Salt, or Carmel & Cheddar Jalapeno), and a box of Chocolate filled Butter Wafer Cookies. The Cookies & Popcorn are made right here in the Dallas area and the Fudge & Peanuts are made in Texas! Includes a Handwritten Greeting Card. Wrapped in cellophane and topped off with a Handmade Bow. Add smiley face balloons for $2 each.